On the map, Thailand is roughly the shape of an elephant’s head, with a long trunk stretching down towards Malaysia. Which is appropriate enough, given how many of these large, peaceful creatures you’re likely to see there. Time spent in Thailand is a feast for the senses, with much to delight your eyes, nose and taste buds. 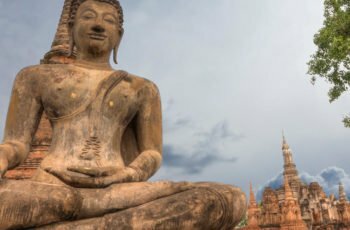 And that’s before we get on to your soul: Thailand is famed for its many wellness retreats, and the expert massage therapists will soon soothe away any aches and pains from the flight, or those need-a-vacation knots you’ve brought with you. Your favourite Thai restaurant back home will seem a pale imitation of the cheap, cheerful and fresh street food that’s available almost everywhere. Aromas of lemongrass, coconut and chili fill the air – you won’t ever have to look far for a tasty snack. 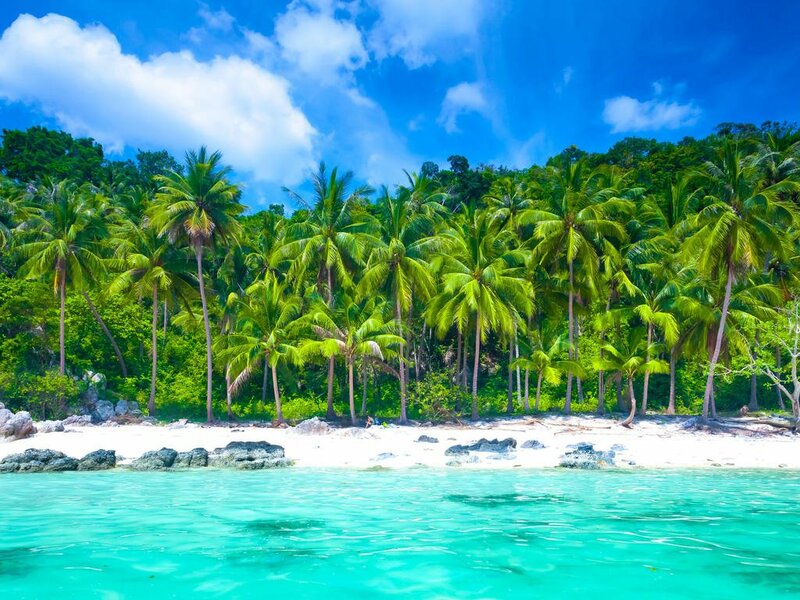 It will almost certainly be served with a side of a wide and genuine smile.Thailand’s scenery is as varied as it is iconic: paddy fields and waving palm trees, long crescents of golden sand and bays filled with islands. Then are the Buddhas, in every shape and pose – standing, in the lotus position or reclining – that are a reminder that this is a peace-loving country.The opportunities for island-hopping are unparalleled, and on each one that you visit you’ll get to take part in Thai beach culture, whether it be a sunset soccer game on the sand or – for the young at heart – an all-night full moon party.Thailand’s scenery includes pristine forests and gardens filled with orchids, as well as lakes turned pink by thousands of blooming water lilies. There is wildlife here too, from slow-moving whale sharks in the warm clear waters to long-armed, loquacious gibbons swinging through the trees.If you opt for an elephant interaction experience, we’d recommend that you choose carefully, and only participate where you can be certain that the animals’ welfare is the top priority. 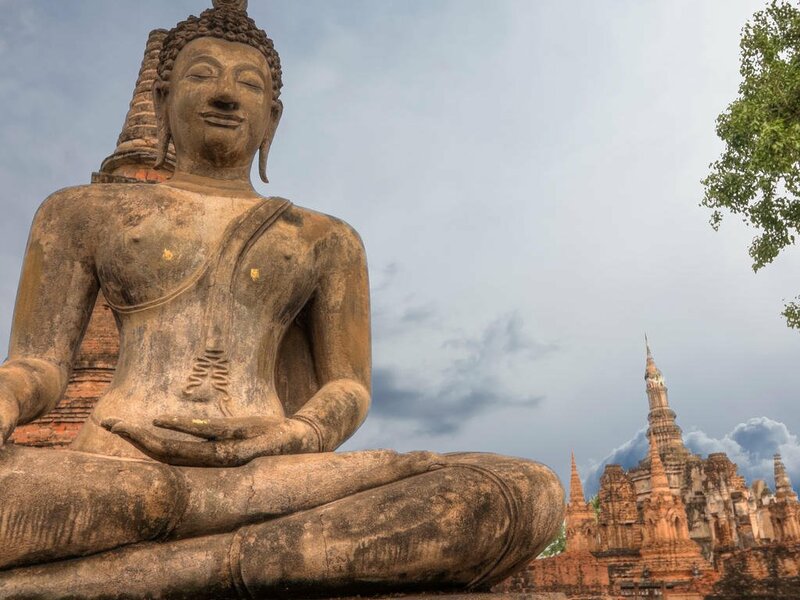 Otherwise kick back, relax and soak up the sensory overload that is Thailand. 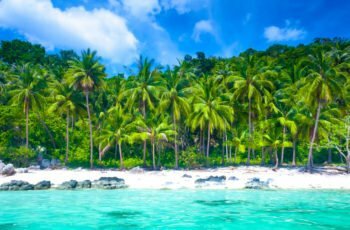 You won’t be surprised to learn that when the producers of the Leonardo DiCaprio movie ‘The Beach’ were scouting paradise locations, they chose Thailand. Electricity in Thailand is 220 Volts, alternating at 50 cycles per second. If you travel to Thailand with a device that does not accept 220 Volts at 50 Hertz, you will need a voltage converter. Outlets in Thailand generally accept 2 types of plug: type A and Type C. Plug adapters are available in Thailand but it is advisable to buy one before you leave home to avoid the hassle of trying to find one when you arrive. CurrencyBaht (THB; symbol ฿) = 100 satang. Notes are in denominations of ฿1,000, 500, 100, 50, 20 and 10. Coins are in denominations of ฿10, 5, 2 and 1, and 50, 25, 10, 5 and 1 satang.The import and export of local currency is limited to ฿50,000. The import and export of foreign currency is unlimited, but amounts over US$20,000 must be declared.Foreign currencies can be exchanged at banks (which have the best rates), hotels (which charge high commissions) and bureaux de changes can be found in larger towns (generally open 0800-2000). Outside large towns and tourist areas, high value notes may be difficult to exchange, so visitors are advised to carry small change.BankingBanking hours: Mon-Fri 0830-1530.American Express, MasterCard and Visa credit cards are widely accepted. ATMs are found in all major cities and almost all provincial banks.Travellers cheques are accepted by almost all banks and large hotels and shops. To avoid additional exchange rate charges, travellers are advised to take traveller's cheques in US Dollars, Euros or Pounds Sterling. Use only bottled or boiled water for drinking, brushing teeth or making ice. Unpasteurised milk should also be boiled, although pasteurised or homogenised milk is available. Tinned or powdered milk is safe as long as it is reconstituted with sterile water. Beware of dairy products that may have been made with unboiled milk. Stick to meat and fish that have been well cooked, preferably served hot, but not reheated. Avoid raw vegetables and unpeeled fruit.Thai food is traditionally fairly hot and spicy, but most tourist restaurants tend to tone down the heat for the more fragile Western palate. Most Thai food is prepared with fresh ingredients such as lemon grass and coriander and rice is commonly eaten with most meals. Popular fruits are papaya, jackfruit, mangosteens, rambutans, pomelos (similar to grapefruits) and, above all, durians, which farangs (foreigners) either love or hate. The thorny fruits have a rather malodorous scent which has even resulted in many hotels banning them from their premises.Excellent food can be found at the stalls of the many street vendors around the country as well as top-notch eateries. There are also many Asian and European restaurants throughout the major cities and smaller towns. 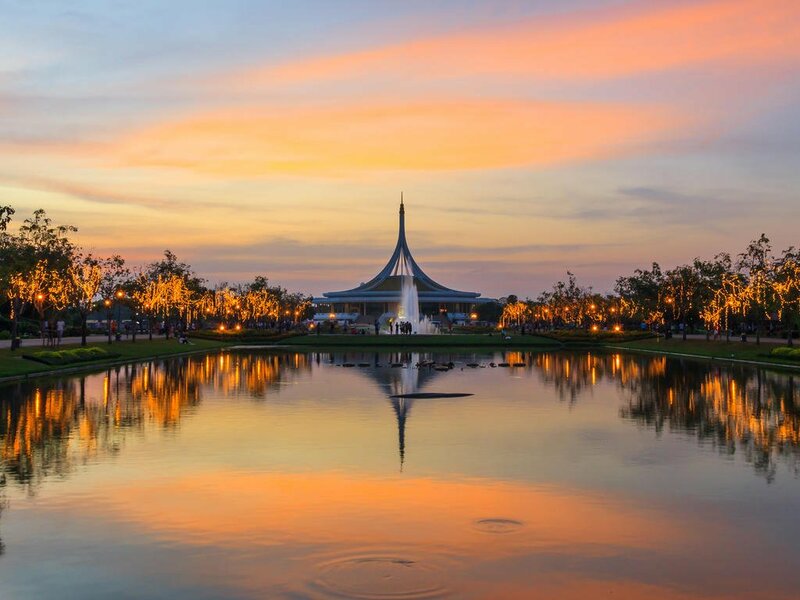 The weather in Thailand is generally very hot and humid, particularly between March and May. The monsoon season runs from June to October, when the climate is still hot and humid with torrential rains. The best time for travelling is November to February (cool season), although the southern islands are best from June to September. Thai Airways International (TG) (www.thaiairways.com) runs services to all major towns, a total of 12 domestic destinations including Phuket and Chiang Mai. Bangkok Airways (PG) (www.bangkokair.com) flies several additional routes including Ko Samui. Discounts are available during off-peak seasons and during special promotional periods. Orient Thai Airlines, formerly known as One-Two-Go Airlines (www.flyorientthai.com) and Nok Air (www.nokair.co.th) also offer domestic flights.Roads in Thailand range from multi-lane freeways around Bangkok to tiny lanes known as sois. Popular routes in the provinces are often four lanes.There is a reasonable road network comprising many highways, which are designated by numbers, and 52,000km (32,300 miles) of national and provincial roads. All major roads are paved.Car hire services are available in all main towns and cities from both international and local companies. The minimum age for driving in Thailand is 18 years and the wearing of seat belts is compulsory. The speed limit is 50kph (31mph) to 60kph (35mph) in towns and cities and 90 to 120kph (52 to 74mph) on expressways and country roads. A national licence and International Driving Permit (IDP) are required. IDPs are valid for three months, after which a Thai driving licence is required. Cars are driven on the left side of the road in Thailand.Taxis are easy to find and cheap to use in Bangkok. In other cities, such as Chiang Mai, local transport such as tuk tuks are much cheaper and more common.Bike hire is available at most tourist locations throughout the country but, due to the erratic nature of driving standards and the heavy traffic, caution must be observed. It is however an excellent form of transport for those wishing to travel the quieter areas of the country.There are many intercity bus services, which range from uncomfortable and crowded buses to luxury, air conditioned coaches. 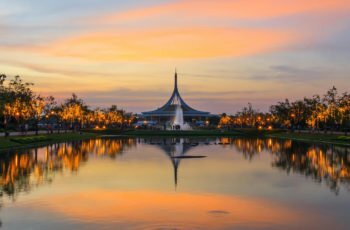 Prices are quite cheap but the appalling traffic in some areas of Thailand makes travelling by bus quite slow.Conventional bus services in Bangkok are operated by the Bangkok Mass Transit Authority, but there are also extensive private minibus operations. Premium fares are charged for air-conditioned (cream and blue buses) and express buses. The ordinary buses are cream and red or white and blue and charge a flat rate regardless of distance travelled. Fares are generally low and are collected by conductors.In Bangkok, taxis displaying the TAXI-METER sign are metered. Samlors or tuk-tuks are three-wheeled taxis without a meter; the fare must be negotiated before the journey commences. These are cheaper than taxis but are only suitable for short distances.There are express, rapid and ordinary motorboat services operated by the Chao Phraya Express Boat on the Chao Phraya River between Nonthaburi pier to the north of Bangkok to Rajburana pier in southern Bangkok. The express boats, marked with yellow, blue or green and yellow flags, are more expensive than the rapid orange-flag-flying boats. The ordinary flagless boats are the cheapest.The Skytrain (BTS), an elevated mass transit system in Bangkok, runs from 0600-2400. The Metro runs from Hualamphong to Bang Sue. Trains leave every five to nine minutes between 0600 and 2400.Chiang Mai public transport is limited to red songtaew (minibuses), tuk-tuks, rickshaws and distinctive yellow metered taxis mainly operating from the airport. There is now a limited bus service in operation.The excellent railway network extends over 4,600km (2,860 miles), linking all major towns with the exception of Phuket. It is run by State Railways of Thailand (tel: 1690; www.railway.co.th; online booking: www.thairailticket.com). There are four main routes to the northern, eastern, southern and northeastern regions, and also a western line serving Thon Buri, River Kwai Bridge and Nam Tok.There are several daily services on each route, with air-conditioned sleeping and restaurant cars on the principal trains. The journeys are leisurely and comfortable, and travelling by train is certainly one of the best ways to get around the country. The Southern Line Express stops at Surat Thani for those who wish to continue by bus and ferry to the islands off the east coast. Most railway timetables are published in English.Ferry services operate between the mainland and several islands including Surat Thani to Ko Samui, Phuket to Phi Phi, Pattaya to Ko Samet and Trat to Ko Chang, and can be booked in person at the dock. Strong competition on all of the major routes ensures that fares are kept low. Reduced services operate during the monsoon season from May through to October along the east coast and Andaman coast, and from November until January on the Gulf coast. The more remote spots become inaccessible during these periods. Lightweight cotton or linen clothing and lightweight rainwear are advised year round. A bathing suit, sunscreen, sunhat and beach wear are essential. A good pair of walking shoes is recommended. Thailand is safe in general. We recommend normal precautions be taken as you would for any city in the world. Be aware of your surroundings and stay in well-lit areas. Don’t flash wealth. If you have items of sentimental value, leave it at home. Visitors should avoid all political gatherings and demonstrations. Make copies of all your important documents such as passports, driver’s licenses, credit cards, etc. Keep copies with you and back at home. If anything is lost or stolen this will be a lifesaver.Passport:Passports must be valid for at least 6 months beyond the intended departure date. Please ensure you have at least one blank visa page (not endorsement pages) in your passport.Visa:U.S. citizens do not require a visa for stays less than 30 days. Non U.S. citizens should consult with your local embassy.Yellow fever certificate:A yellow fever vaccination certificate is required for travellers coming from a yellow fever infected country. It is otherwise not required or recommended. You should be vaccinated at least 10 days before you travel, as this will allow enough time for your body to develop protection against the yellow fever infection. Your proof of vaccination certificate will only become valid after this time.